Kapruka, in partnership with Stone N String, offers you this absolutely beautiful keepsake of a message from the heart written in pure 24 karat gold. This special golden ink technology will last many decades without any discoloration. 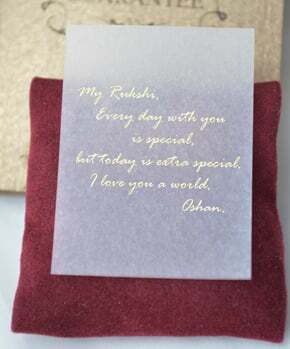 This is a one of a kind gift that will be treasured by your Forever Love, Always. Enter your message below and we will print in gold. It will take 2 days to process your order.